I know that this post will get a lot of attention, and not all of it positive. The last time I wrote about vaccines—when Jenny McCarthy joined “The View”—it sparked a serious debate in the comments section. In 2013, the Journal of Pediatrics found no connection between vaccines and autism. In 2011, the Institute of Medicine found no connection between vaccines and autism. In 2010, Andrew Wakefield, who first proposed the connection between vaccines and autism, was stripped of his medical license for fraud. What do you think of the vaccine numbers? They seem incontrovertible to me. Is there something I’m missing? I can’t figure out if you are pro-vaccines or anti. Im just saying that the FDA who deems medications save is governed by the same people who says that the workd is overpopulated by 90% and who says its ok to take in known carcinogens and toxins as long as its justa little bit at a time ahd who says its ok to dispose of toxic waste in products for human consumption. Just so you know: they dont give a damn about the health of anybody exept the health of their bank accounts and the greater good of humanity even if it means exterminating 90% of the human population.. And the people selling the vacinations to the governments is making a killing! o and there is scientific evidence showing that unvacinated children had the same or less number of occurences of measles. There was also a scientist who recently came forward about the cervical cancer vacination and how its a a big money making scheme with no proven facts that shows it works. Last thing. I am just womdering if the statistics mentioned in this article was released by independand researchers or people or companies who are directly or indirectly benifiting from promoting that millions of people be injected by mercury and aluminium and dead viruses. Vaccinations used to be good, but they have added so many toxins in them that they can be dangerous to some people who are sensitive to them. I think you need to do much more research. I suggest you start by reading the book, Vaccine A: The Covert Government Experiment That’s Killing Our Soldiers–and Why GI’s Are Only the First Victims. Don’t swallow everything the FDA and big pharma wants you to believe. They are not looking after our best interests anymore. They are really just after the almighty dollar. I think there are legitimate concerns about many of the ingredients in vaccines. But on the whole I do believe the benefits outweigh the risks. I think the anti-vax green folks are much more vocal than the pro-vax or at least more neutral greenies. I have more moderate views but tend not to go for the big controversial topics on my blog b/c that’s not really my thing. I have thought about writing about my stance on vaccines (which is basically the slow vac approach) just to throw out another perspective and show not all greenies are anti-vax though. While every discipline has its biases and we must always be conscientious about the influence money can and does play in scientific research, I am very skeptical the conspiracy theories floating around out there. Great comment, Betsy thank you so much for your perspective! Please let me know if that;s OK. Thank you! Anti-vax? Intelligent design? Christian fundamentalism? Come on America! You talk about muslim extremists wanting to bring back medieval times but you’re doing it to yourselves. I’d wish you’d get yourselves back on track before this nonsense gets out of control. Not out to offend anyone but the US has such an amazing track record based on science, research and innovation. Why are so many of you intent on screwing that up? I live in an area that has many immigrants from countries with major health problems. I know first hand that these children travel back to their native countries and return to our schools. I am happy that my children are immunized from whatever may be brought into this country from elsewhere. I feel that the the rise in illnesses is from outside forces and tot hose who have not been immunized. I know some say who immunized now against measles or mumps etc , they have been gone from the US for years. Well yes, but it is being brought in from people who immigrate here. I am not in anyway opposed to immigration but I’m sure the native American Indians would have liked to immunized against Europeon diseases before we can to America. Those diseases resulted in an extreme amount of deaths. Well lets make sure our children don’t experience the same issues. And yes I agree, my child is not safe even with the vaccinations unless there is a majority of children vaccinated. They stated that vaccines can not be fatal, yet as mentioned above there were 139 deaths associated with HPV vaccination. Here is the information below from the VAERS. How does one explain the discrepancy? Rachel, why didn’t you post my other shorter comment on the information given in your WHO link? The Myths presented by WHO? Thanks Deborah, I’ve approved every comment that came through. Would you like to post it again? My apologies if we had a system error and thanks for your input! The public health system is not trying to give your children autism. It is not trying to make your children ill and does not want them to die. It is not going to recommend a vaccine if it has not been rigorously tested and determined to be safe. It is not going to put an adjuvant in a vaccine if it does not believe it is safe. Those judgments about safety come from years of trials, years of analysis, and critical review by experts in their field. By choosing to enter the medical or the public health field, those people have made a commitment to the health and safety of the public and it is, frankly, offensive to suggest that the entire system and all of the people working in it are in the back pocket of “big pharma.” It’s naive to think that there are nefarious plans on the part of health professionals and the government. Thanks to vaccines we have eradicated an entire virus from the planet. Prior to the introduction of vaccine, smallpox lead to death among 30% of those who were infected, and painful and life-changing deformities in many who did not die. It killed off most of the native population of this country. And now that disease no longer exists. Might a few people have become ill from the vaccine? it’s possible. But the number of possible deaths caused by the vaccine as opposed to those caused by the disease itself is infinitesimal. And the probability that your child was the one who would become ill from that vaccine was nearly nothing. Thanks to vaccines we have also nearly eradicated polio. That makes two diseases that cause great suffering and death that have nearly been wiped out from the entire planet thanks to vaccines. And in most of the developed world we had virtually eradicated measles, but now it’s back, thanks to parents who simply choose not to vaccinate their children, a decision often based primarily on junk science and a lack of the skills necessary to understand, critically analyze and interpret data and results. Again, that’s really not meant to be condescending, but truly getting inside the data and understanding correlation and causation and how to determine them is fundamental to making those decisions. And at a certain point you need to trust that the people trained in doing so are looking out for the best interest of you and your children. Chronic lower respiratory diseases: 138,080 *this should be Alzheimer’s now. I have read peer reviewed articles – not just books. My children are 7 and 3 and are not vaccinated. They are no threat to your children and shouldn’t be coerced into being vaccinated to protect “the herd”. My children are very healthy, They have never been on antibiotics, 1 of them has had chicken pox naturally and is protected for life now. (The vaccine has actually caused chicken pox to be more prevalent now and more adults are getting it.) My children eat wholesome, real food, get 11-12 hours of sleep each night, stay home and warm when ill , yes – take vitamins and fish oil and vitamin D and bounce back fast. I am not concerned with vaccinating them for childhood diseases. How can you say I have bought into alternative medicine? Why does choosing not to do something mean I am a proponent of something else. Healthy eating is not alternative! I didn’t say I rely on homeopathy or bach flower remedies or saunas! Although they all can be useful for some things! My message is just to let parents make their own decisions in their children’s health. The age of specialization has led to parents giving over full control over their families’ health. Common sense and familial wisdom passed down from generation to generation seems to have vanished. This is apparent in childbirth, infant feeding and treating childhood illnesses and the over-vaccination of our children. I don’t see how American children today need more vaccinations than my generation did in the early 70’s. Have we genetically become weaker? More nasty viruses and bacterias becoming opportunistic? Or has the pharmaceutical industry found vaccines to be so very lucrative? And parents found children too exhausting to stay home and take care of them when ill? It’s a sad state of affairs. You missed the entire point about medical errors, didn’t you? Yes, the article from Mercola claims that medical errors are the third-leading cause of death in the US. But did you read the article where his information came from? And do you have the necessary background necessary to fully understand what is in the document? I’m not saying you don’t, but it’s something important to ask yourself. If I start reading a book on pottery and the appropriate use of water, I’m not going to be able to judge the content because I have no knowledge or background on the subject. The actual scientific report states that preventable adverse events “contributed”. That’s an important distinction and one that you and Mercola are not paying attention to. It does not say that the PAE “caused” the death. You know what else the author’s say? “[L]ethal PAEs as a result of care in hospitals cannot be estimated in a statistically rigorous way” The estimate is also based on 12 deaths. 12 deaths have been extrapolated to nearly 200,000. What isn’t stated is the reason why those 12 people went to the hospital. Would they have died if they had not received medical treatment? Those against hospitals (not saying you are one, to be clear) will use that stat to say, “see, hospitals kill” without knowing whether or not they would have died had they not gone to a hospital. The underlying assumption here is that the event that was adverse itself was what was preventable, not the fatality. For instance, someone suffering from a heart attack that is not properly diagnoses that then dies would be considered a PAE that contributed to a lethal fatality. The study does not state whether or not that heart attack was lethal to begin with. Those are important distinctions that you either are overlooking, are not aware of, or don’t care about. And I’m not really for the chicenpox vaccine anyway. Chickenpox has a fatality rate of 0.004%. And, just so you’re aware, getting chickenpox doesn’t really mean you are immune for life now. Shingles is a reactivation of the chickenpox virus. As far as 1970 to now…kids get Hib vaccine. Before this, there were 20,000 cases a year and all were considered possibly life-threatening.. Kids are also getting Hep B. Every year, 2000-4000 people die from Hep B. I could go on, but I’m not going to waste my time. So, do we need vaccines because we’ve become weaker? No, of course not and that’s just not a serious question. We give vaccines because they help and can prevent deaths. Do you seriously think that if we could eliminate disease that we wouldn’t be better off? Do you think the world is a better place with kids getting diseases that could kill them? I think it’s funny that Mommy Greenest spends so much time researching the toxins and chemicals in beauty products and is behind so many causes for the welfare of humanity, but completely overlooks the POISONOUS adjuvants that are inherent in vaccines. Do you really think there is no neurotoxicity to our children? Is everyone really this stupid to believe whatever the government tells them is “safe” after you yourself go on and on about toxins in foods and products? Our children are guinea pigs for these vaccines- do some research and learn about all of the people who have died or been rendered mentally challenged due to this experiment- they are simply collateral damage to a government that wants to create mindless lemmings. Do the math on the autism rates. I think it’s beyond frightening that you take these facts listed above at face value. To answer your question- YES YOU ARE MISSING SOMETHING. Can you list the poisonous adjuvants, the levels at which they are poisonous (remember, water can be poisonous in the wrong dosage), and the levels that are found to be in specific vaccines? And, can you please post where you got this information? Do the math on the autism rates? Really? How about doing the math on the rate of autism and the rate of bottled water consumption. Or any number of other things that have increased in the last few decades. Besides which you completely miss the concept of increased diagnosis and a better (and more broad) definition of what autism spectrum disorder is when just looking at autism rates alone. So, now who’s taking “facts” at face value? These numbers are not “incontrovertible”. More people would have died in third world countries of the same diseases due to lack of clean water and malnutrition. So, vaccines may have been the obvious choice for those people. Access to clean water and eating nutrient-dense foods (not fast food!) and staying home and keeping warm when ill goes a long way in a First World country. Most Americans don’t seem to know how to take care of an ill child or care to; sending them off to school when sick. Point number 2: “1000 American children have died from illnesses that could have been prevented by vaccines”. Were those 1000 children healthy and strong and not immune compromised? Or are all the children just lumped into that number? Were these healthy children? How many of the 167 children per year (not including 2014) were already immune compromised? How many countless others have been damaged by vaccines? According the the Vaccine Adverse Event Reporting System Report there has been a total of 139 deaths of girls treated with the HPV vaccine. That is incontrovertible. When medical errors are the 3rd leading cause of death in America it is difficult to trust he medical community at large. You seem to with the masses of doctors from Journal of Pediatrics and Journal of Medicine. How many books on vaccination have you read? Also, wanted to mention that the herd immunity number changes over the years and is different for bacterial infections vs viral. This subject is not so black and white. And, for the record, not everyone chooses to forgo vaccinations because of autism. Surprisingly, I hadn’t heard of Andrew Wakefield until 2 years after my son was born (2007) and chose not to vaccinate for many other reasons. I say, surprisingly, because I read several books, numerous articles, NiH website, pharmaceutical company vaccine ingredient labels, etc. but hadn’t come across Wakefield’s work until later. No one wants to see children die, but we should be able to choose how we want to take care of our children’s health than be coerced or ridiculed into putting “junk” into our children’s bodies. Most anti-vaxers have down extensive research. Love this. Thank you! Yes, we have done extensive research. These aren’t decisions we take lightly, and it certainly isn’t easy when you’re in the minority and face criticism from others. Here’s the thing though about “doing our own research”: none of us can, as individuals. Even if you’re a PhD or MD in these fields, one person can’t really do this sort of comprehensive research on our own. That’s why we have to rely on scientific organizations like the Centers for Disease Control, which consists of thousands of PhDs and MDs who have dedicated their lives to this research, to come to consensus opinions. Sorry I checked out for a while. I really think this is an important perspective. Thank you for sharing, Stacy! First, where are you getting your numbers that medical errors are the 3rd leading cause of death?! I did find an article that said that, but it said that medical errors contributed to the number of deaths that they were using. Basically, they’re saying that someone came into the hospital with something that could have been treated and because it either didn’t get treated or was incorrectly treated, they died. That is not at all the same as they went into the hospital for a minor condition and then were killed by the hospital which is what the article I saw was suggesting. Having any number of deaths that were preventable is terrible, of course, but the same goes with vaccines. Anyway, the point is that that number is comparing apples and oranges. If the person hadn’t had the heart attack or internal bleed, they wouldn’t have been in the hospital to have been improperly treated in the first place. Yes, there have been deaths attributed to the HPV vaccine. And that’s terrible. However, there have been, using your number, 139 deaths out of 57 million doses. That’s in infinitesimally small number. And each year, an estimated 26,000 new cancers are attributed to HPV. So, I’d say the benefits outweigh the costs…but that’s your decision to make as well. And, it’s not that surprising to me that you hadn’t heard of Wakefield. The problem was that Wakefield led to a whole host of people then trying to get vaccines pulled and they were trying to find any reason whatsoever to do that because of what Wakefield fradulently reported. So, all kinds of people were writing books and articles about the “dangers” of vaccines to try to prevent kids from getting autism. So, while you may have not heard of Wakefield, what you were reading was a direct result of his work. And, seriously…just because a book was published does not mean that there is a shred of evidence or truth in it. Instead of books, I would suggest reading peer-reviewed scientific journals. The science in them is generally better, although if someone lies about their data, then anything can get through (see Andrew Wakefield). And, I’m sorry, but I gotta say…I chucked at the “immune compromised” line. You want to say that we’ve bought into big pharma, but you’ve bought into alternative medicine in the same way. As if kids weren’t dying from these diseases before the vaccines. There is a reason that these vaccines were developed…the diseases caused a lot of damage. I’m not sure how your number is incontrovertible, but the author of this post’s numbers are not. Are you saying that her numbers aren’t true? Thanks so much for posting this. Like Stacey De-Lin said, I was a little bit afraid of what I’d find based on the header in the email. I’m so relieved to see this here, especially on a site that I think is likely to capture a good chunk of an anti-vaccine audience. As a public health professional working in vaccine preventable diseases I can assure you that there is a very stringent scienfitic process that goes into the approval of vaccines and recommendations for immunizations, based on thorough reviews of all of the available knowledge. That the facts are contested by anti-vaccine campaigns with no scientific basis is astounding. I can understand a parents’s emotional need to find an explanation for an upsetting diagnosis, but vaccines simply aren’t that explanation. I just was sent this link on Facebook and thought I would share it here: http://www.who.int/features/qa/84/en/ Really great breakdown from the World Health Organization. I’m not necessarily against all vaccines, but I do think the recommended vaccination schedule should be reconsidered. Plus, I’m bothered by all the toxins mixed in with the vaccinations. Just like we can’t trust many “conventional” food and beauty products, we also can’t trust what kind of toxic cocktail we’re getting in the vaccines (or where they’re being made). We’ve chosen to follow a reduced and sporadic vaccination schedule for our daughter, while also consulting a homeopathic doctor for increased immunity support. Because she is in a daycare, she is exposed to many bugs, but she has remained much healthier than her fully vaccinated counterparts. I attribute this to two years of breastfeeding, a diet focused primarily on organic foods, and our reduced vaccination schedule. Her young immune system has had time to develop fully without being bombarded by the constant influx of vaccinations. 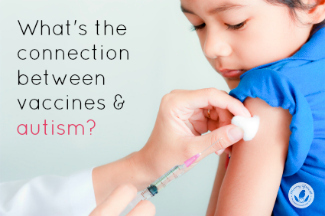 We have taken responsible steps to educate ourselves on the pros and cons of vaccinating and are aware that we must look for other (natural) remedies to bolster her immune system. Many other parents I know who feel the same way have also researched their options thoroughly. And many of us know a child who has been adversely affected by vaccines. We don’t take this decision lightly, especially since it’s often met with critical and insensitive remarks (and misinformation). Finally, to me, the bottom line is this: If everyone is so confident that vaccinations work, then why are you concerned about others not vaccinating? If they truly work, you shouldn’t have anything to worry about. In some people immunity wanes; great examples are measles, mumps, and rubella, For the majority of people, they receive lifelong immunity, However, if their immunity wanes, they have been previously protected by “herd immunity”– the concept that when others around them are vaccinated, the disease cannot spread so they won’t be exposed again. Now, when the disease begins to reappear due to less people being vaccinated, those whose immunity waned are now susceptible to the disease. Wasn’t Aspartame also subjected to rigorous testing for effectiveness and safety? Many things we once considered “safe” are now known to be hazardous. 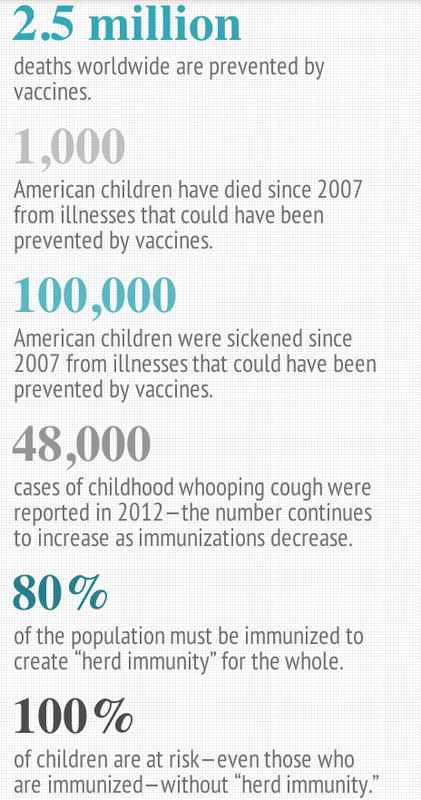 In my opinion, it’s just a matter of time before vaccines become a bigger part of this list. I’m honestly not interested in debating the subject or arguing with anyone. I commented originally because I support Rachel’s work on Mommy Greenest. 🙂 We’re all entitled to our own opinions. I am confident in our personal decision because I’ve seen firsthand how much healthier our daughter is than her vaccinated peers. Do vaccinations help? Sure. But so does a healthy diet and lifestyle, clean water, and sanitary living conditions. Just one comment. The overall health of a child really has little to do with vaccines. Vaccines prevent against specific illnesses. So, it’s great that your child seems healthier than other children around them. Could be genetics or it could be that you’re doing something very right. But, the fact that your kid gets less colds doesn’t say anything about vaccines one way or another. Now, if other kids are getting measles or any of the other diseases that are vaccinated against and yours doesn’t, then that would say something. Not sure if that’s what you meant though. Thank you, thank you, thank you! I am tired of reading information that is not based on science. I am tired of basically “dead” illnesses making a comeback. I am tired of people dying needlessly. Great post. Thanks Denise, and thanks for reading! I’ll admit, I was a bit nervous when I read the title of the article on the website “Mommy Greenest”– I was worried this would be an anti-vax article! I want to thank you so much for posting this important data. I am a physician in New York City, where we are currently experiencing a measles outbreak in the neighborhoods where vaccinations have decreased the most. After decades of research by multiple scientific groups, we know vaccines are safe and life-saving! I’m going to keep and share this infographic. Oh that must be so scary, Stacy. I hope that you can help those families! Thank you for reading, and for commenting, I really appreciate you joining this conversation. You haven’t missed a thing. You actually took facts and applied them to real world issues and got perfectly understandable answers. How others don’t see this is what’s missing. Keep up the great work! Dr Suzanne Humphries, a practicing nephrologist (kidney physician) says the vaccine industry isn’t giving people both sides of the story, and parents need to get informed before subjecting their children to vaccines that can potentially cause serious harm or even death. Thanks for sharing, and I appreciate that you trust this one doctor. However, I think the body of evidence shows that an overwhelming majority of doctors are in favor of vaccinations, especially in light of the findings of the Journal of Pediatrics and the Institute of Medicine, as listed above. so the “herb immunity” level has been reached yet you say the numbers of illness is rising. Unfortunately the data for older children and adults would not load for me. I would suspect the data for older children is higher since school children are required to be immunized and it is difficult if not impossible to get a waiver to not immunize for school. I’m confused. “God” makes an amazing universe filled with amazing organic food and (s)he skimps on peoples immune systems so we need to inject toxins into our babies and ourselves? I’m not saying no medical intervention is ever necessary. I am saying the research says vaccines are both dangerous and ineffective. Unfortunately the numbers that the CDC is reporting are aggregated at the national level. In a nation of 350 million people, those vaccination rates are not consisitent across all communities and therefore herd immunity is not achieved uniformly. If, say, measles were introduced in a community with low vaccination rates where there is little to no herd immunity due to those low vaccination rates, you will see an increase in transmission and active infections of measles. Local outbreaks are reflected in local data, not national data..
“Righteous Indignation”: I think if you met me at, say, a dinner party, you wouldn’t be so quick to accuse me of being in the pocket of the drug companies. I’m actually quite a nice person! 🙂 I’m a family medicine physician practicing in a low-income clinic in New York City, and I can promise you “big pharma” (who, exactly?) has never given me a dollar, or even taken me out to dinner. This is what is so confusing to us as doctors: what kind of monsters would we have to be to know a drug is dangerous and inject thousands of children with it each year? Every pediatrician and family medicine doctor I know vaccinates their own children. This is an important fact to consider as well. You aren’t missing a thing and it’s so great for mommy bloggers to share the obvious facts that vaccines do not cause autism and they do save lives. Keep up the great work! Thanks for sharing this important information. The anti-vax movement is scary, and having real results. Children are dying from completely preventable illnesses. I appreciate you sharing this important information.